Exfoliating shouldn’t be limited to just the face, but sloughing your whole body comes with a sloppy consequence: an oil slick left behind in your shower or tub. Having to do extra house cleaning when trying to replicate a spa experience at home is a drag. 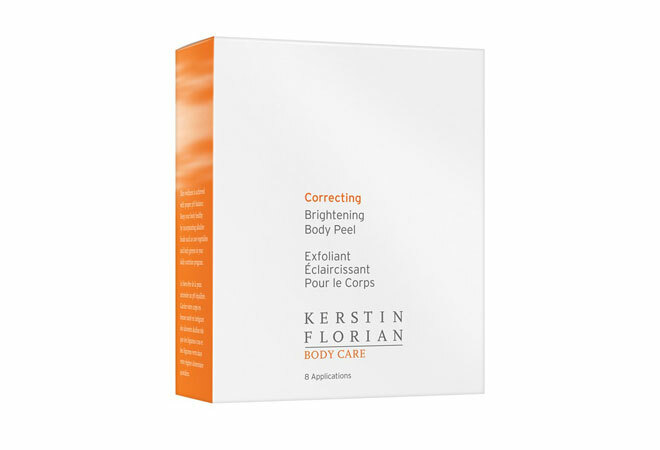 Luckily, Kerstin Florian remedies the mess with their new Brightening Body Peel ($40). The eight-pack of individual wipes are like mini-facials for the problem areas that I’ve always thought required a non-gritty peel (think foot skin worn tough by flip flops, for example, or the sensitive décolleté area exposed by sleeveless dresses). Each wipe is pre-soaked with a gentle blend of glycolic, salicylic, and lactic acid and is fantastically easy to apply. You simply place over the area in need of an exfoliating boost, wait three minutes, and hop into the shower to neutralize the peeling action. The peel pads are perfect for anyone battling “bacne” (breakouts on the back, which usually worsen as temperatures and the humidity index rise), and they are ideal for anyone who uses supercharged sunscreens, which don’t rinse off well with basic cleansers. I used the fragrance-free pads on my legs and arms after a quick dry brushing, which removes the dead skin cells and helps prime the skin for body oils. My results: zero redness and wonderfully smooth skin.